Richard Panek • Mariner Books, Houghton Mifflin Harcourt, 2011, 297 pp. If many scientific quests should be marked with an academic form of caution tape: “Progress = 2 steps forward + step back,” cosmologists have been in steady retreat for decades. The “cosmo” girls (and mainly boys) who explore the origin and fate of the universe were once mocked as data-free arm wavers. Then, in 1964, cosmo was promoted into a science by the discovery that echoes of the Big Bang were rattling around the universe. The unexpected arrival of data — of fingerprints of the ultimate past — allowed observational astronomers to budge the theorists in the search for the origin and fate of everything. Here’s the big picture of cosmology: Big Bang creates matter, which expands for an instant faster than light (please hold your questions for the end). Matter proceeds to form galaxies, black holes, stars and weird beams of energy. In 1929, Edwin Hubble discovered that the universe was expanding: The further the object, the faster it recedes from us. The biggest explanation of all began to leak when astronomers noticed that galaxies were spinning so fast that they should fly apart as their centrifugal force overwhelmed the gravity that their mass created. Galaxies have not gotten the memo, and they are calmly rotating rather than flying apart. Dark matter was the first tragedy inflicted by data on cosmo theory. When cosmologists tried to decide if gravity would eventually recall the far-flung stars and galaxies back into a “big crunch,” they found something utterly inexplicable: In 1998, two scientific teams announced that the rate of expansion was rising. Some anti-gravity force — some “dark energy” — was apparently to blame. If dark matter is hard to find, dark energy is hard to envision. As the news about dark energy sank in, the prospect of figuring out what’s what melted faster than a frozen butter sculpture in July. Today, the embarrassing accounting of our cosmological conundrum says that, astronomers, with all their fancy education and ultra-slick telescopes, can only see 4 percent of the universe. Most scientific books proceed from the unknown and proceed to make it known. But The 4% Universe, ensnared in the twin realm of darknesses, does the opposite. It’s deeply unsatisfying, but as any cosmologist would say, so is that 4 percent picture. 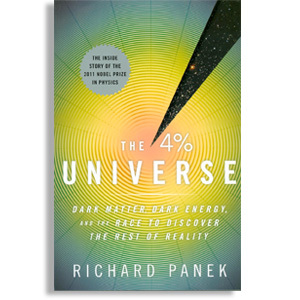 The 4% Universe documents a more familiar form of dark energy — the thirst for headlines among two gangs of “bickering eggheads” that more or less independently found the accelerating expansion. Without shying away from scientific subtleties, Richard Panek has written a biography of dark matter and dark energy, and of the legion of physicists and astronomers who chased the ultimate question mark. You’ll meet star-chasers, careerists, self-promoters and lone geniuses intent on answering a simple question: What’s out there?